Welcome Sunday! I hope everyone is having a nice and relaxing day. I am really glad I was motivated to get some yard work done yesterday morning because it started raining in the afternoon. Then the rain turned into a thunderstorm which soaked everything. I was going to go out and work in the garden this morning before church but it was still too wet. So instead I decided to make muffins for breakfast. 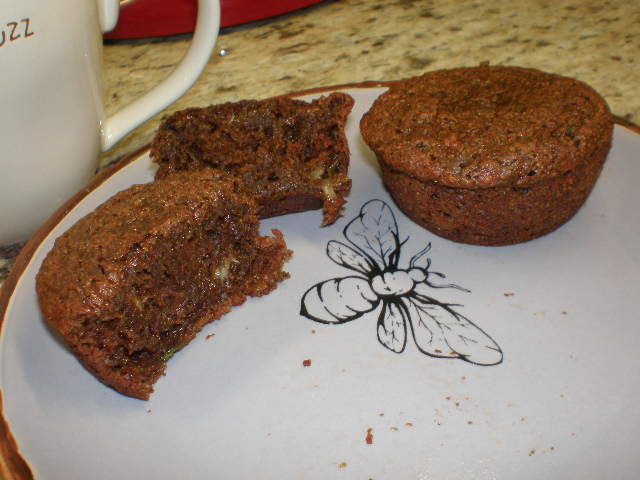 I still have several zucchini in the fridge and I’ve had my eye on the chocolate zucchini muffin recipe over at Happy Herbivore for awhile. I gathered the ingredients together and got started. First step was to shred the zucchini. 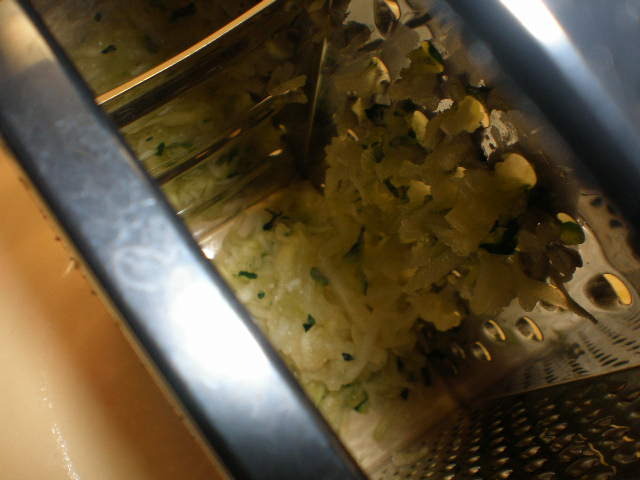 About 90% of the time I shred zucchini manually. I’ve also used the shredding blade on the food processor, which is great when I need to shred a large amount of zucchini. But for a small amount I don’t like to drag out the entire food processor and then wash all the parts. 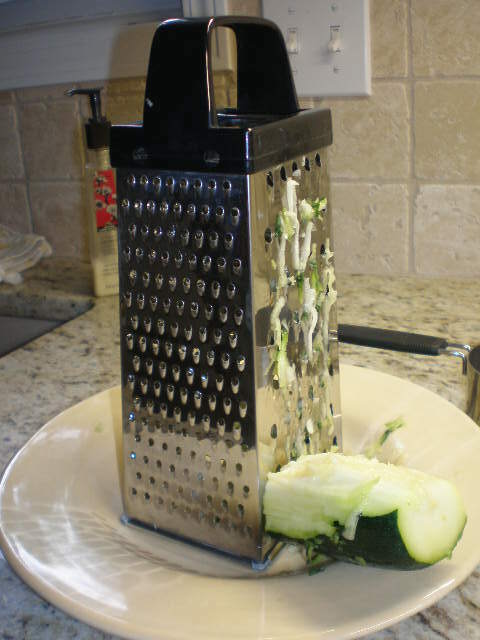 I think it’s just as fast to use the box grater. All I do is cut off a chunk of zucchini and then shred it on the large holed side over a plate. The zucchini goes in the middle, then when I think I have enough I scoop it all out into a measuring cup. The muffin batter was easy to pull together. I like that the recipe uses whole wheat flour, banana and applesauce. It does call for a cup of sugar, which is a lot to me these days. The recipe notes say you can reduce to a half cup if desired. I used the full cup this time, but I think I will reduce the amount next time. If you have a really ripe banana and are using sweetened non-dairy milk, you might not need as much sugar. Unfortunately my muffins didn’t rise up as pretty as the ones pictured on Happy Herbivore’s post. They had flat tops. This could be because my baking powder is a little old. And for some reason they weren’t quite done when I cut one open, though they had passed the toothpick test after baking for 20 minutes. I had this same issue with done-ness when I made zucchini bread a couple weeks ago, so maybe this has something to do with the zucchini. Still the flavor was great and definitely warrants another round in the near future. I have a lot of zucchini to use up! I am going to try them again with new baking powder and see what happens. I think these muffins would be great to stock in the freezer so I could pull one out whenever I need a (healthy) chocolate treat. My nice Sunday breakfast. 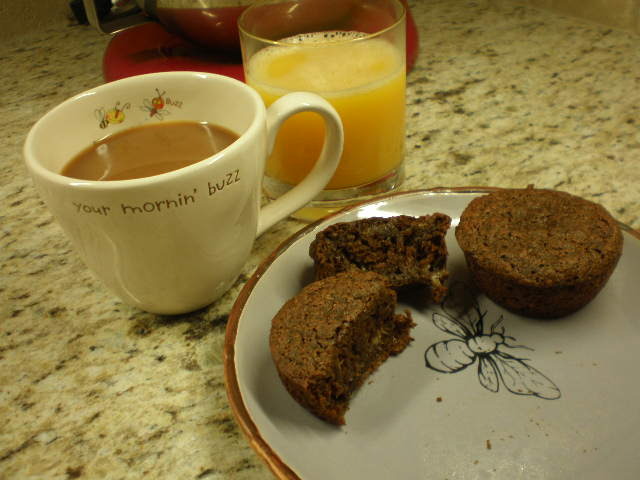 Two muffins, coffee and orange juice. I looooooove coffee. Enjoy your Sunday my friends. Relax and get ready for the week ahead! I love zucchini bread but this year didn’t plant zucchini because I wanted more space for tomatoes! Also, I was so overwhelmed with it last year that I sort of didn’t want to deal with that.